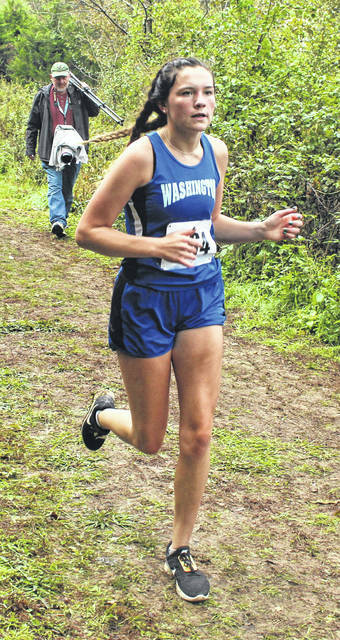 Washington’s Cloe Copas (562) climbs the hill at Rio Grande at the start of the Division II race Saturday, Oct. 20, 2018. Copas placed 20th to qualify to Saturday’s Regional meet at Pickerington North High School. Miami Trace’s Lilly Litteral (295) and next to her Hayley Lucas compete in the Division II District cross country meet Saturday, Oct. 20, 2018 at Rio Grande. 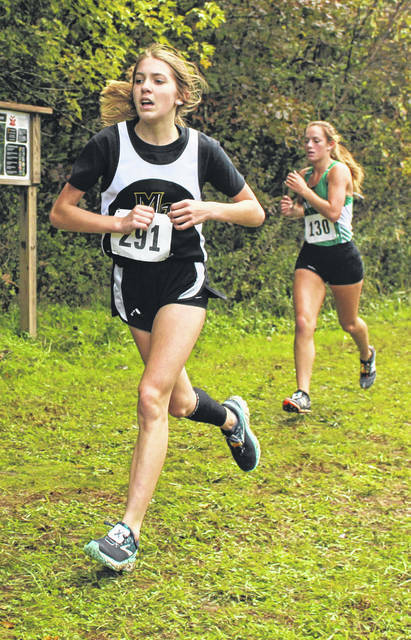 Mallory Conklin, above, left, was the top placer for Miami Trace, coming in 45th out of 117 runners in the Division II District cross country meet at Rio Grande Saturday, Oct. 20, 2018. McKenna Garren of Washington makes her way along the course at the Division II District cross country meet at Rio Grande Saturday, Oct. 20, 2018. Washington’s Abby Tackage somewhere along the course at the Division II District cross country meet at Rio Grande Saturday, Oct. 20, 2018. Miami Trace’s Devan Thomas (left) during the Division II District cross country meet at Rio Grande Saturday, Oct. 20, 2018. 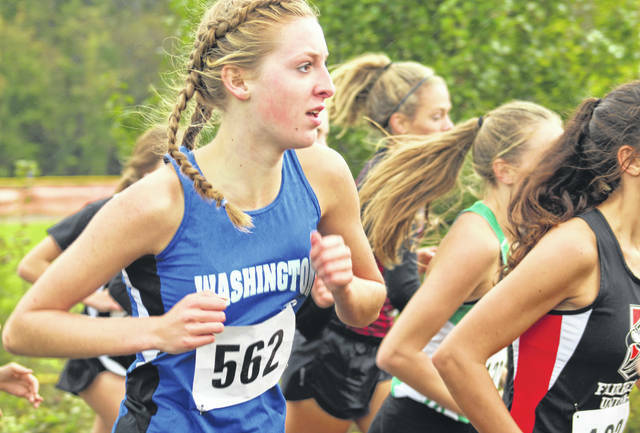 RIO GRANDE — Washington High School sophomore Cloe Copas is moving on to the Regional cross country tournament after placing 20th here Saturday morning, Oct. 20. Copas ran a time of 21:27.36 to place among the individuals who will compete Saturday at Pickerington North High School. There were 117 runners in the Division II girls field this year. Copas was 41st last year at Rio Grande with a time of 22:17.34. 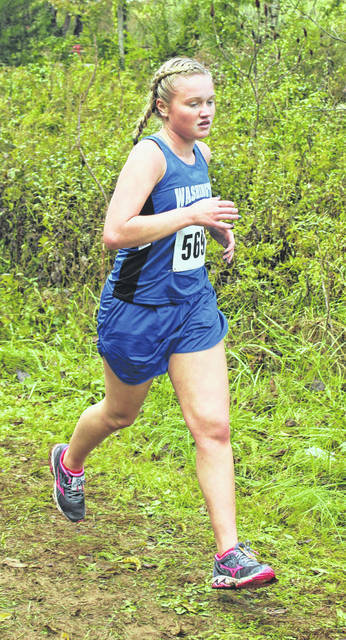 “Cloe had to be in the top 28 to advance to the Regional,” Washington head coach Ryan Day said. “She ran a really strong race. I haven’t had a chance to look at all the times and splits, but, her goal obviously was to advance out of the District meet today; she did and we’re very proud of her. “She’s put in a lot of hard work, so, it’s rewarding to see her advance,” Day said. As a team, Washington was 17th with five competing out of an allowable seven. Shawna Conger placed 79th in a time of 26:20.23; Mia Moats was 98th in 29:27.36; Abby Tackage placed 100th in 29:33.94; McKenna Garren was 105th in 32:09.12. “Everybody ran slow today,” Copas said. “But, I got out really hard in this race. My goal was to get out hard because Coach (Louis) Reid told me if I got out hard and stayed with the front pack, it would secure my spot. What about the Regional meet? Copas’ career personal best time is 20:44. The Division II Regional girls race at Pickerington North starts at 2:15 p.m. Saturday. Miami Trace had four girls competing Saturday. Mallory Conklin was 45th in 23:08.94; Devan Thomas placed 97th with a time of 28:26.04; Hayley Lucas was 108th in 30:00.04 and Lilly Litteral was 109th in 30:02.70. “We only had four runners today,” Miami Trace head coach Jeff Smallwood said. “Mallory’s been hurt but she fought through it. Next year it would be her goal to advance to the Regional meet.